If there’s an arcade genre that has stood the test of time as fun, it’s the twin-stick shooter. You know the games: Robotron, Smash TV, Asteroids. While developer Housemarque has been creating THE twin-stick shooter experiences since the 90s, it wasn’t until the HD version of Super Stardust that people really started to take note. While they’ve put out some other fantastic games like Outland and Dead Nation, the next game that really took the genre to the next level was Resogun. Housemarque is here to redefine the genre once again. 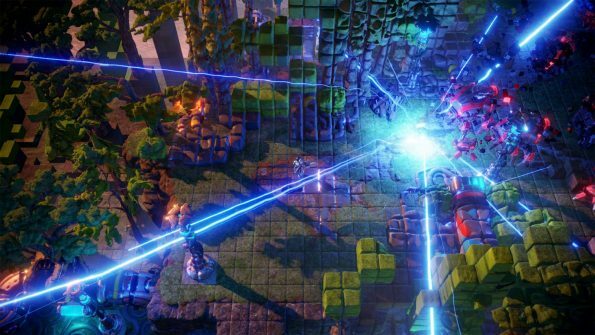 Nex Machina was created with Eugene Jarvis as a creative consultant. If that name means nothing to you, note that he worked on several of the aforementioned titles, in addition to the likes of NARC, Total Carnage, and the Cruis’n series. Put simply, it’s hard to think of someone more attuned to the nature of arcade games. Pairing him with Housemarque is a dream come true. The game at first glance is strikingly beautiful, with an enhanced engine that was used for Resogun. While both are great looking games, Nex Machina stands well above the other. From the set pieces to the character models, and even the explosions of voxels, everything here is improved. Saving the humans is back, which creates a sense of urgency in each room as you introduce the enemies to your arsenal weapons. Of course, saving them is optional, but as is typically the case with an arcade game, you’re playing for the high score, and every little bit counts. In addition to the normal movement and shooting you’d expect, you also have secondary weapons in the form of pickups and a dash button. Dashing allows for movement without being damaged, which is useful as one hit will kill you unless you have a shield. And with a seemingly endless supply of enemies in certain rooms, on top of the near bullet-hell type gameplay, that dash is necessary for avoiding death. In addition to the shield that you can pick up, you will also find enhancements to your bullet spread, rocket launchers, swords, bombs, lasers and more. The difficulties are steep, although they are certainly fair. If you absolutely need to beat the game, but really struggle with deaths, the easiest difficulty has an unlimited amount of continues. The normal difficulty offers 99, while the hard only provides 10. Of course, beating the game without any is an option as well, but that will take the most dedicated of players. If you die in a room, you can learn from your past mistakes, as the AI will play out in a similar manner. Naturally, the way you approach it will change the way they interact. And humans are always top priority depending on the enemy, so you may want to take advantage of them being distracted before picking up the squishy life-forms. In addition to the obvious objectives of humans, killing all the enemies including the level’s boss, and not dying, there are many secrets to discover. And with the sheer amount of things going on in each room of the levels, they are easy to miss. You’ll be playing levels over and over to find everything the developers have hidden, and quite honestly, I wouldn’t have it any other way. It provides more reason to go back to previously played levels other than beating your friends’ high scores, which is already plenty of reason in a game like this. Speaking of friends, if you have someone you like to play things with, this offers local co-op. If you think the screen is insane by yourself, just add a whole other person shooting bullets to the mix. Note that the co-op is limited to local, and it’s really no wonder as any amount of lag could lead to disastrous results. Even with a solid internet connection there are hiccups, and honestly, most people don’t have their systems hardwired to a high speed connection. It’s awesome that the option is available, and smart that they stuck with the couch. While the arcade mode is the game’s obvious focus, there’s also an arena mode that will task the player with beating levels under different conditions. Think of games that add certain handicaps while expecting you to still beat it. Can you beat the level with increased enemy speed, or under a certain time limit? You will find challenges like this in the trophy list as well, and they add so much to an already content rich game. The only thing left to sweeten the deal is the music. Ari Pulkkinen lays down some very heavy, trance like beats, which is par for the course with him. While it is what you’d expect, it doesn’t make the soundtrack any less mesmerizing. The only thing that would make it better is if the music actually synced with what was happening on the screen, but as there is so much always going on, many times it feels that is the case. As always, Housemarque delivers with a game that is not only simple, but fun beyond compare. It’s rare that a developer is able to create new IPs that are consistently described as something that you’ll be addicted to the moment you play them, but that is undoubtedly the case here. Nex Machina is sitting at the top of my list for not only Housemarque games, but PS4 titles available right now. Strap in, get your thumbs ready, and make some voxels go boom. 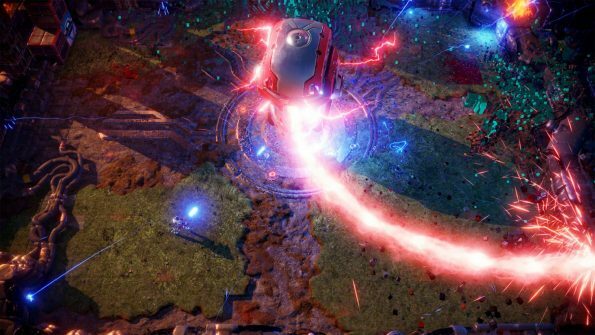 Nex Machina was developed and published by Housemarque. The game launched on PC and PS4 for $19.99 on June 20th, 2017. The game was provided to us for review on PS4. If you’d like to see more of Nex Machina, check out the official site.